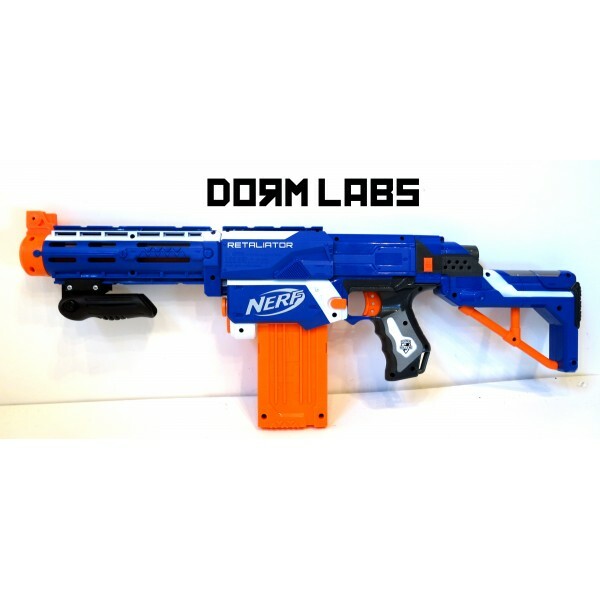 Dorm Labs is a sort of a new company, with not tooo much featured or news on the major Nerf blogs about them. They appeared online in June 2013, starting with GoPro attachments. Since then, they’ve added to their catalog with sights, optics, slings, pouches, foregrips, shirts, and even a tactical vest! One of the best parts about their site so far, is the VERY reasonable prices for their items. I’ve also seen a few points online complimenting their product quality, and haven’t seen anything negative posted about them online so far. A friend of mine has their blaster holster and GoPro Rail Mount, and I can say that those products at the very least are well constructed. For more details on how to enter their contest for a FREE Tactical Foregrip, make sure you have a Facebook account. Then, check below for the rest of the instructions. That looks like a really nice foregrip! Would go great on a Rapidstrike. Also, love the new site design!